Affiliation Part of 23-campus California State University System. Located in Arcata, 270 miles north of San Francisco and 95 miles south of the Oregon border, on 144 acres of land, it is nestled in a spectacular setting of redwood forests, rushing rivers, ocean beaches, and mountain ranges. Facilities - 144 acres main campus. - Plus an additional 591 acres which HSU owns, leases, or has use agreements to (marine lab, observatory, natural history museum, saltwater marsh, freshwater marsh, small lakes and ponds, forest lands, sand dune preserve, research vessel, First Street Gallery, and the Wildlife Care Facility). - 963,127 square feet in 90 buildings. 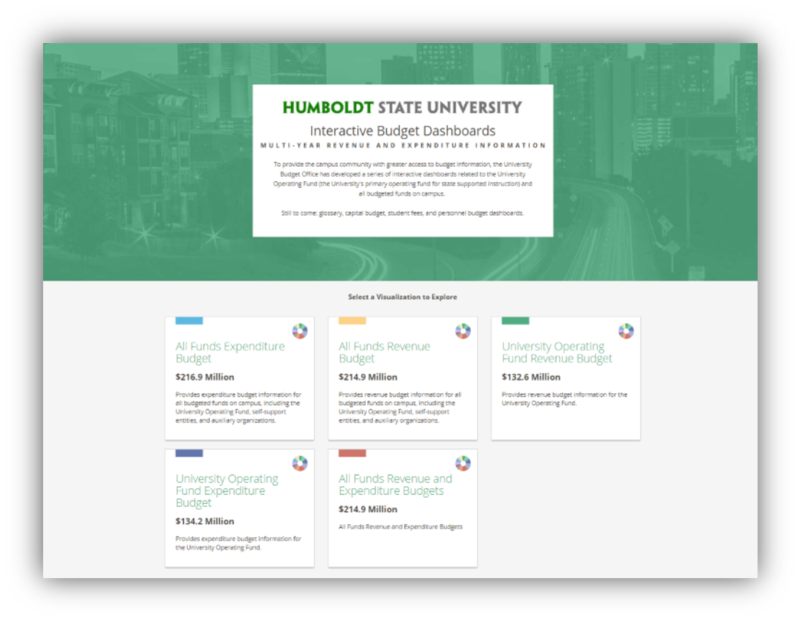 The HSU Budget Office sought a new approach to portray the breakdown of the University’s budgeted revenues and expenditures in a more visual and interactive format. 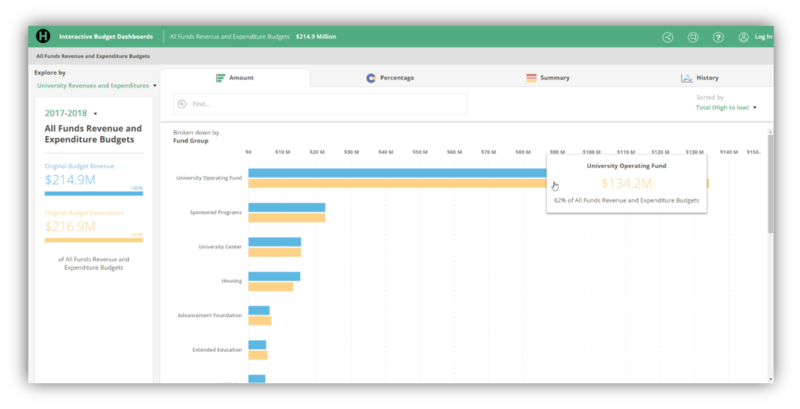 The Budget Office wanted to make information about their budget spending more transparent, and to make information about the budget more easily accessible to the public in a user-friendly method. 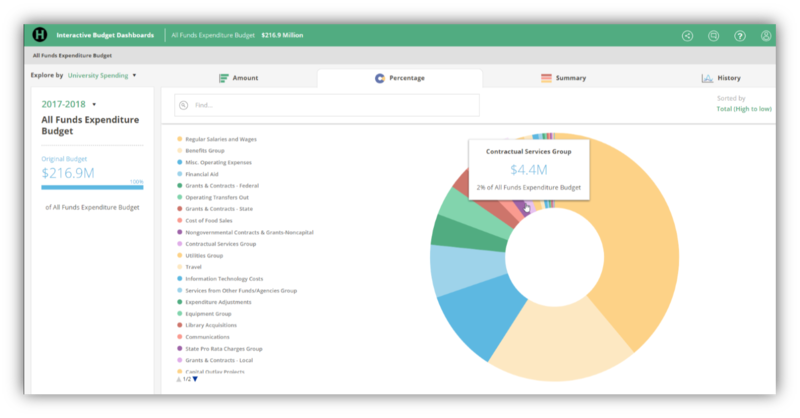 Questica created OpenBook as a more user-friendly approach to exploring and relaying information about budgets and other data. Depending on what data an organization would like to share with its internal or external stakeholders, a visitor or user of the custom OpenBook site can explore the charts, graphics and tables. OpenBook provides different views to help illustrate where resources are being allocated in the budget. OpenBook promotes greater understanding with functionality that allows visitors to drill down on information to gain further insight about specific areas and types of activity. 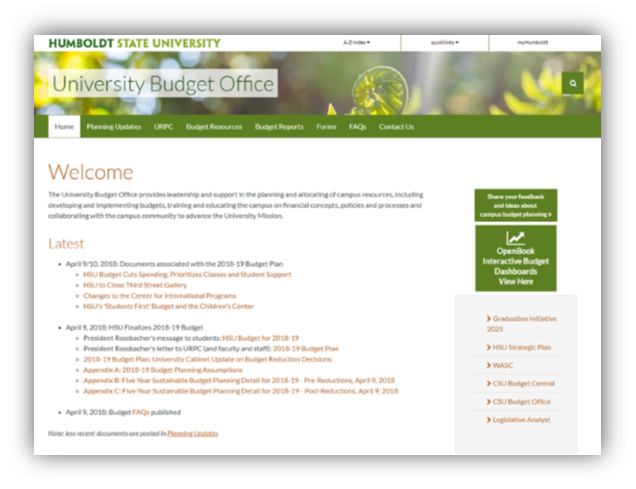 The HSU Budget Office has created a website that displays breakdowns of the University’s budgeted revenues and expenditures, and it lets visitors view budget information in different ways, such as by organizing data by types of spending and by organizational structure. Visitors can break down data into further detail, and its visualization tools, such as displaying dollar values and percentages by hovering over charts with a mouse, makes information transparent and straightforward. HSU sought to enhance visibility and transparency with both its internal (faculty, staff, executive management, deans, department heads, etc.) and external stakeholders such as students, donors, alumni, and the greater community. The Budget Office uses OpenBook to help answer questions and generate discussion about the budget within the campus community. OpenBook provides users with different charts and breakdowns of how the University’s budget is being allocated to different departments. HSU plans to continue to enhance how they communicate to the campus community by adding more dashboards for visitors to access from their website, which could display budgets for personnel, student fees, and capital projects. The HSU OpenBook website allows visitors to view a five-year history of the Operating Fund budget information, and three years of all-funds budget information. This allows the Budget Office to review and plan their current and future budgets, with historical and current data. It also informs the public how the Budget Office has adapted their budget allocations overtime, and ultimately helps Humboldt improve their budgeting for the future. Data can be uploaded into OpenBook through a direct integration with Questica Budget, or from other sources, which makes it easy to continue to create different dashboards and add additional information to their OpenBook website. With Questica’s OpenBook as their data visualization and transparency solution, HSU has been able to increase awareness and foster dialogue about their budgeting practices. 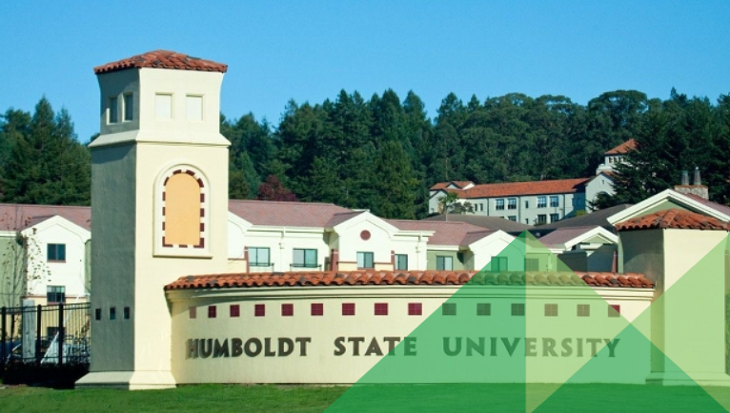 Thanks to more transparent budgeting solutions, Humboldt State University is brilliant.